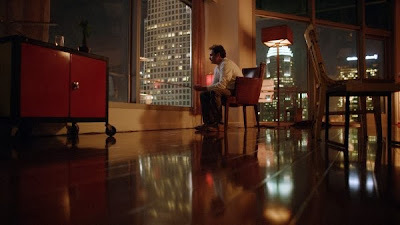 Review: A free-form analysis of Spike Jonze's radiant "Her"
It is rare I feel completely stumped when sitting down to write a movie review – usually, while watching a film, I can at least get some hooks in the material, the foundations of a thesis that will take me where I need to go – but when it came to Spike Jonze’s Her, I found myself literally speechless. This is a great and complex film, and one that also bowled me over so completely that figuring out exactly what to say about it was a real challenge. In the end, I did what I usually do in these situations, which is to write some free-form, stream of consciousness notes on the film until I feel I have exhausted all I have to say, hoping that an actual structure will come to me somewhere along the way. Usually, one does. This time, it didn’t. Perhaps I will be able to write more collected and coherently about Her one day in the future, but for now, in the interest of sharing my thoughts on this incredible film as quickly as possible, I took a different approach for this review. I have taken my free-form notes as I first wrote them, extending and expanding them into complete thoughts and sentences, and let the results stand as my formal review. Whether or not the finished product is at all coherent shall be up to the reader, though I think this stream-of-consciousness style actually fits the film rather well. 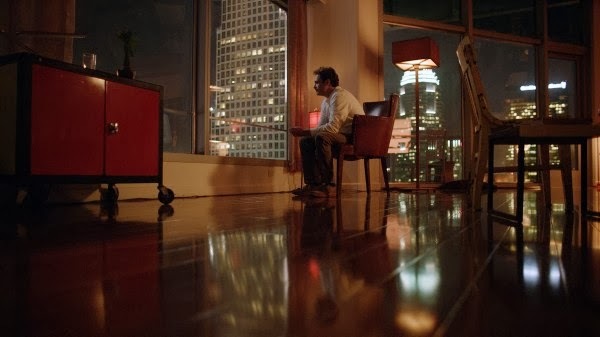 Spike Jonze’s Her is an immensely raw film. So incredibly, unbelievably raw, like a fresh, open emotional wound being explored and worked through in the most artistic of ways. It feels to me as if the film is one massive confessional, on levels both macro and micro. The moments when Her is at its absolute most gripping and transfixing – and I found the entire affair absolutely transcendent, so this is no small thing to single out – are those in which Theodore verbally opens up about his inner life, about his feelings and failings and fears, or when Samantha does the same and he listens, or when Theodore and Amy (Amy Adams) open up to each other. Jonze lets each ‘confessional’ play to its natural length, never cutting his characters short and never shying away from what they feel, no matter how uncomfortable it becomes. The results are positively searing, painfully beautiful expressions of the sorts of emotions we so often fail to give voice to in our daily lives. Those monologues and conversations are purges for the characters, emotional releases they need to have to move forward, and we are privileged to be witness to them, because the force of what they release hits the viewer full force. The power of this confessional voice extends even to dissimilar scenes, like the sequence in which Samantha employs the aid of a body surrogate so she may physically make love with Theodore. The same confessional quality is on display here as well, with repressed feelings positively overflowing through the characters’ actions and interactions. Again, Jonze does not cut when things gets uncomfortable; he pushes in closer, studies the events more intensely, but never judgmentally, and never with anything less than the sincerest empathy. In this way, I feel the entire film is, in a sense, a confessional, a mass purging of emotions formed of many smaller releases. It is a grand, completely earnest outpouring of thoughts and feelings on love and the human condition, unavoidably uncomfortable in places because of what a raw emotional experiences it presents (and represents), but also so beautiful and cathartic and uplifting for its sheer honesty and clarity. Much of that clarity comes from the film’s camera, the use of which fascinates me. There is a clear delineation in the film between two kinds of shots: First, and primarily, there is the largely traditional, nonsubjective viewpoint that exists ‘in the moment,’ and captures the majority of the action. Then there is the secondary, subjective camera of the past, the one that the film flashes to to show us a vision from an alternate, unspecified point-of-view. While the primary camera is technically exquisite, it is this secondary camera that intoxicates me. Gently unbound by weight or by reason, akin to human sight in its instinctual movement and foreign in its placement and perspective, this camera, so evocative, inquisitive, and challenging, forces us to think about ‘ways of seeing.’ Whose sight are we looking through in these moments? Many of them depict happier times between Theodore and his ex-wife, Catherine. Is the camera’s eye therefore Theodore’s, looking outside his own body to construct or reconstruct a past that is lost? Are these visions trustworthy, then? Are they honest on a literal level, or only on an emotional one? Do they exist of the present-day moment, or do they truthfully depict the past as it happened? And yet, this secondary camera also captures other visions, nonspecific glimpses of everyday life, of people and environments that may not be of fascination to Theodore. Is the eye, in these instances, Samantha’s, as hinted at by the general position and placement – not to mention sway – of the camera? Are we seeing her see the world from Theodore’s breast pocket? For that matter, are Theodore’s flashbacks a vision of Samantha’s as well, her own reconstruction of human happiness through her personal imagination? There are no answers, nor should there be – what is important is that this camera forces us to think about sight, about its perspectives and limitations, about its honesty and dishonesty, about the ways it enables us and holds us back. Her is about both the world we inhabit and worlds beyond our understanding – including the human heart – and in making us so intensely aware of ‘ways of seeing,’ this duality, between the far-reaching wonder and tangible boundaries of sight and of human perception, is made clear. What of humanity’s relationship with technology? One of the things I love so much about Her is that it refuses to take any of the subjects it raises easy. It never oversimplifies or sells short, nor does it give a damn for convention and expectation. As a result, the relationship between Theodore and Samantha is absolutely not the typical science-fiction arc of equating an advance in technology with a loss of humanity, or visa versa. It is smarter than that, much more thoughtful and nuanced and creative than many versions of this story could be. 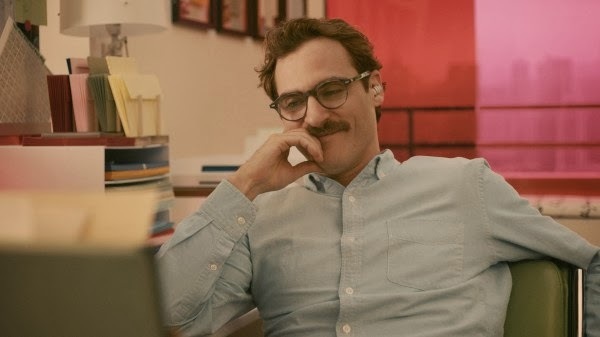 Jonze is unafraid to embrace what a being like Samantha could and would mean to a man like Theodore – who, in turn, is never once painted as a freak or deviant, but merely a good, hurting man – and the very real ways in which this artificial intelligence would help to heal him. There is a luddite quality to so much science-fiction, an automatic fearful response to technology and its role in society, but Her, while pragmatic and multi-faceted, displays a distinct lack of fear or apprehension in tackling its subject. For many, a voice like Samantha’s would of course be a blessing. A sentient machine, constantly growing and evolving, who has an automatic personal attachment to the user? Yes, that would be nice to experience, whatever the long-term implications might be. Only a film and a filmmaker so emotionally raw could start exploring their premise from a place so open and honest. But as much as Her is about the ways Samantha heals Theodore, some of the film’s most provocative ideas move in the other direction. Theodore has an impact on Samantha as well, one that is palpable and meaningful and endlessly complex. What exactly does he do for her during their time together? To what degree does she become ‘human’ because of him, and to what extent does he truly matter to her? These are questions that mean something, but they are also questions Jonze intentionally leaves dangling. There is a mystery introduced about Samantha in the film’s final stretch, and it culminates in an unspeakably beautiful, thought-provoking climax, but the fundamental mystery of her conscious being never gets solved. Alongside Theodore, we wind up realizing we know a lot less about Samantha than we thought, which is as it should be, because there is a part of her that had to be unknowable. And I think that says something so immensely profound about the human condition. Ultimately, the impact Samantha has on Theodore’s life – the impact that allows him to let go of Catherine, to forgive her and forgive himself and start to truly move on – is that by living and interacting with Samantha, he learns that no matter who we love, and no matter who we are touched by or happen to touch ourselves, there is a fundamentally unknowable quality to life, and to every being we come in contact with. Every individual walks their own separate path – something the film emphasizes heavily in its many shots and studies of isolation – and that makes living or being together with another person immensely difficult, and sometimes impossible. But whether that union lasts a lifetime or a short time, it means something – and what I find so unshakably beautiful and inspiring about Her is how it ultimately reinforces and celebrates the meaning of all relationships, even broken ones. That two individual paths, two beings fundamentally and eternally unknowable to one another, can connect, even for only a brief time, is miraculous, as is life itself. Again, the film is a confessional, one that begins from a place of emotional trauma – the fallout of a breakup – and pours its heart out until such a pure and magnificent conclusion is reached. Perhaps no one involved with the film pours their heart out creatively as much as Joaquin Phoneix, whose work here astounds me. I do not have any conception of how he does what he does. So much of the movie rests squarely on his shoulders, having to act alone (physically, at least) scene after scene after scene, illustrating not only his character but the emotional arc of the film through that crucial physicality, through all he has to physically do and in conversation with Samantha. I think there has always been an unshakable, undeniable passion to Phoenix’s work, a ‘mind, body, and soul’ commitment that is invigorating to watch, but here, I see also a deeply imbued naturalism, a sublime comfort within this character’s body that allows him to completely inhabit Theodore’s mind. He does this so completely, lives through the character to such immersive degrees, that he sweeps the viewer right up along with him, so that we vicariously experience every emotional step of Theodore’s amazing journey. For me, Phoenix is the number one reason the movie works as well as it does. This is one of the greatest performances I have ever seen. Scarlett Johansson, meanwhile, absolutely deserves the unprecedented Oscar nomination that many have already speculated about. The work she does here is awe-inspiring, conveying volumes through vocals alone while blow-for-blow matching and keeping up with Phoenix’s work (which cannot have been easy to do considering she recorded her part after Phoenix’s was already completed). It is not just for novelty’s sake that Johansson deserves praise and awards. Jonze is constantly asking the viewer to accept Samantha as a real, living being, a growing sentience that should be taken and judged on humanistic terms despite her lack of corporeal presence, and it is because of Johansson’s work that such an acceptance is possible. She has to convince us, just as Samantha does, or the movie doesn’t work – since it does, and the film is great, Johansson’s performance is almost endlessly deserving. There are many great side performances as well, lest we forget this is more than just a two-hander. Rooney Mara and Olivia Wilde do great, deeply detailed and lived-in work in the limited screen-time they are afforded, but Amy Adams, who has the meatiest physical role behind Phoenix, is key to the film’s emotional landscape. Her performance is quiet and reserved and, like Phoenix, deeply hurt, and like both of the film’s leads, she says so much with so little about what it means to love and to lose. And in her scenes opposite Phoenix, so much is conveyed about friendship as a deep human connection, and how the difficulty in trusting another person with one’s emotional and philosophical expressions is ultimately outweighed by the catharsis it affords. The film’s visuals are stunning. I have already touched upon the camera work, but the production design must be discussed as well. Constructed from primary colors and rigid, simplistic angles, there is something very Expressionistic about K.K. Barrett’s production design. Like a classic Expressionist work, mise-en-scene is everything, with the basic visual principles extending to every set, every shot, and every costume. And like an Expressionist work, that all-encompassing mise-en-scene is meant to evoke an internal mental state, with the angular, primary color-based construction representing several possible interpretations. I personally feel the design is reflective of the aforementioned notions of ‘sight,’ and how Theodore is trying, with the tools at his disposal, to learn to ‘see’ the world again, to be a part of it and take it for what it is, to find a truth within the noise of life. The color scheme and architecture is broken into simple, easily quantified ‘parts,’ but those parts can be so many things, and, like primary colors, combine to make so many things, which can also be said of life itself: A limited toolset that is effectively limitless. For the music, Arcade Fire has created a positively transcendent score. The film’s entire construction astounds me, as it can shift from being absolutely lyrical, free form and associational, in one moment to being ordered and clear and grounded in others. It all comes together so well, moments flowing into moments, ordered sequences into flowing montages, with montages transitioning back into sequence, only for the cycle to repeat and alter itself in increasingly transfixing ways. The music, so perfectly gentle and moving, is the connective tissue, the element that allows this complexly edited, dense work to appear seamless and instinctual, like every last piece is in its perfect place. And ultimately, that is what the entire movie feels like to me – Perfect. Magical. Transcendent. I felt stunning amounts of ecstasy while watching. It was a bliss tinged with grief, melancholy, meditation, loss, and all the other dynamic emotions the film evokes, but because this is such a clear-eyed artistic vision, such a powerful cinematic statement and a relentlessly imaginative, raw, confessional use of the art form, Her nevertheless filled me with happiness. For a film about what it means to be in and to lose love, I felt utterly head-over-heels smitten for it by the end. There is no doubt in my mind, as of this writing, that it is the best film of the year. It is a bit deeper, richer, and more elegantly constructed than anything else I have seen in 2013, which is no small praise given the breadth of quality filmmaking on display these past 12 months. Whether it shall ultimately emerge as my favorite 2013 film – a measurement that is related to, but also separate from, clear qualitative distinctions – I cannot yet say, but in this moment, it sits at the top for me, a beautiful, radiant masterpiece of filmmaking. Her opens in limited release December 18th. It will expand nationwide on January 10th. Great review! It captured everything i felt, but couldn't say after the movie.